The result is a vehicle that first and foremost delivers the exhilarating and refined power of a V8, with the fuel efficiency of a 4-cylinder engine. Combined fuel economy of 27 mpg (estimated) is expected to be the best in class. And one other thing, with its compact Lithium-ion battery, the new Infiniti M35h also delivers an uncompromised interior and competitive trunk space. “Taking its inspiration from the design and hybrid technology found in the breakthrough Infiniti Essence, the new M Hybrid is the only car you can buy today with more than 350 horsepower and 30 mpg,” said Infiniti Vice President Ben Poore. “As hybrid technology has gotten more sophisticated, so have hybrid drivers. Where it was once enough to offer fuel efficiency alone, today’s hybrid buyers need performance and handling to go along with the ‘green’ attributes – and that’s where the new Infiniti Hybrid delivers like no other,” he added. Key to the M35h’s inspired – and green – performance is an innovative yet elegantly simple gasoline/electric drivetrain, which ensures that zero-emissions electric propulsion is used more often, for longer periods and at higher speeds than in typical hybrids. The M35h can drive on electric power alone at speeds up to 62 mph. It can travel on electric propulsion for up to 1.2 miles at a time. Tests have shown that in mixed diving, the Infiniti M35h is able to drive in electric only mode for as much as 50% of the time. “Total test fleet mileage was significantly greater than is typically accumulated in a new vehicle development cycle – the equivalent of circling the globe more than 23 times,” added Poore. The 3.5-liter DOHC 24-valve V6 combines with an electric motor and high-power battery to produce 360 horsepower (hybrid system net power). The M35h deploys its power in a manner entirely in keeping with Infiniti’s sports handling philosophy Infiniti owners have come to expect. Both the gasoline V6 and electric motor deliver their power to the rear wheels via a 7-speed automatic transmission. A new Hybrid Electric Power Steering system can help reduce fuel consumption by approximately 2%. The single electric motor and compact Lithium-ion battery pack boost efficiency further by helping keep the weight gain over the M37 down to 276 pounds. The batteries are located behind the rear seat, but the M35h is one hybrid sedan with practical luggage room, with the trunk able to accommodate four golf bags or two large suitcases. At the heart of the M35h is a front-engine, rear-wheel drive layout based around an innovative drivetrain featuring a one-motor, two-clutch parallel hybrid system. The technology, which was previewed in the Infiniti Essence concept, endows the M35h with linear power delivery, stirring acceleration and the responsive rear-drive handling of a true Infiniti. The system is called the Infiniti Direct Response Hybrid™ system. Two new technologies are fundamental to the M35h’s broad-ranging abilities. One is the Lithium-ion battery pack – quick to alternate between charging/discharging and, size for size, twice as powerful as conventional Nickel-Metal Hydride batteries. The second is the direct manner in which the power is delivered to the rear wheels through the 7-speed automatic transmission. This is central to providing the performance feel expected from a true luxury sports sedan. The first of the two clutches is a dry clutch installed between the 3.5-liter V6 and the electric motor. It facilitates full decoupling of the V6 when the car is in electric drive and power regeneration modes. Decoupling the V6 reduces mechanical losses and boosts efficiency of the electric motor. The electric motor is rated at 50 kW (67 hp) and peak torque of 199 lb-ft. It acts as either a propulsion unit, alone or in tandem with the V6, or as a power generator. As well as charging the battery in the normal way, the motor recovers energy otherwise lost during deceleration and braking. 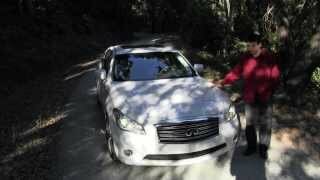 The 302 horsepower gasoline engine is Infiniti’s proven 3.5-liter V6. It was chosen for torque characteristics (258 lb-ft at 5,000 rpm) that perfectly complement the electric motor’s output. The electric motor’s high torque from zero rpm provides strong performance from a standing start and contributes to the sporting feel. As well as its fast charge/discharge response and 1.4 kWh capacity, the Lithium-ion battery pack is laminated to enhance the cooling performance. Temperature stability is further improved by the use of manganese positive electrodes, helping provide exceptional battery reliability. Extra weight, the bane of many hybrids, is kept in check in the M35h by the lightweight batteries and features such as the single electric motor, no torque converter and innovative steering and braking systems, in addition to the strict weight-savings already integrated in the Infiniti M design (including extensive use of aluminum components). It all helps keep the curb weight of the M35h at 4,129 pounds. The technology comes together to make a high performance hybrid that’s electrically powered for more of the time, and at higher speeds, than competitors’ hybrids. The new Infiniti M35h is equipped with world’s first steering and braking technologies, which have been designed to deliver both environmental benefits and natural driving feel. The steering is an electro-hydraulic system with “on-demand” assistance. It offers the advantages of both types of steering – the natural and smooth feel of hydraulic power steering and the improved fuel efficiency of an electric system. The assist motor cuts in only when the wheel is turned, further boosting efficiency. The system is more compact and lighter than traditional power steering set-ups, achieved by integrating multiple parts. The Electric Driven Intelligent Brake System™ is similarly designed primarily to suit sport sedan buyers’ needs, while at the same time contributing to the M35h’s efficient operation. An electric booster motor is utilized to operate the brake cylinders, saving mass that would otherwise be added by a reserve pressure tank. The primary benefit of the system is that by controlling both regenerative and friction braking, depending on motor operation and battery condition, the Infiniti M35h operates more efficiently – recovering otherwise wasted energy. The simplicity of these elegant mechanical solutions, with their emphasis on compactness, lightweight and fewer parts, is made possible by advanced computerized control. The M35h utilizes the proven FM (Front Mid-ship) platform, along with the M37’s independent double-wishbone design in front and multi-link independent system in the rear. The suspension system also features front and rear stabilizer bars and double-piston shock absorbers that have been specially tuned for use with the M35h. Standard 18-inch aluminum-alloy wheels and P245/50R18 V-rated all-season performance tires are offered on the Infiniti M35h, with tri-split 5-spoke aluminum-alloy wheel design available as part of the 18-inch Wheel Package. The Infiniti M35h is also the word’s first hybrid to provide a standard feature to help alert pedestrians to its presence. The new Approaching Vehicle Sound for Pedestrians (VSP) system uses a range of distinctive sounds to help alert other road users that the vehicle is approaching. VSP automatically works from start-up to approximately miles per hour, cutting back in at approximately 15 miles per hour as the vehicle slows. 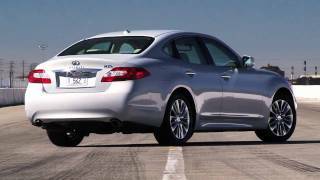 The noise sweeps from high to low frequency depending on vehicle speed and whether the Infiniti M35h is accelerating or decelerating. It is loudest at start-up to indicate that the vehicle is may begin to move off, while an intermittent tone is used when reversing. 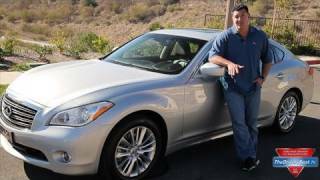 Like the gasoline engine-equipped Infiniti M37, the new Infiniti M Hybrid features an elegant yet sporty exterior and interior design. The exterior design is multi-layered, just like the body surface itself, which was conceived to mirror reflections from different angles to create a sense of mystery and allure. Its balanced, rear-wheel drive proportions and stance, with a long, low hood and high rear deck, provides a roomy cabin, uncompromised by the M Hybrid’s compact battery design (located behind the rear seat). The deep body shape of the fenders and doors give the M sedan a powerful look unlike anything on the road. The wave-style doors are constructed from aluminum for light weight, despite the material’s difficult formability. Other exterior features include an expressive, signature Infiniti double-arch upright low grille and crystal-look headlight clusters, 18-inch aluminum-alloy wheels, and a wave-like trunk with a high aerodynamic performance that works like a spoiler to increase downforce. Standard features include a power sliding tinted glass moonroof with one-touch open/close, tilt feature and sliding sunshade, automatic on/off High Intensity Discharge (HID) bi-functional Xenon headlights with windshield wiper interlock, dual exhaust with polished tips, power-folding heated outside mirrors with reverse tilt-down feature, rain-sensing variable intermittent front windshield wipers and courtesy lamps built into the outside door handles. An Adaptive Front lighting System (AFS) with auto-leveling headlights is available as part of the Technology Package. 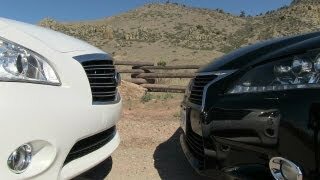 The Infiniti M Hybrid is available in seven exterior colors: Malbec Black, Liquid Platinum, Platinum Graphite, Storm Front Grey, Black Obsidian, Moonlight White and Harbour Blue. Inside, the Infiniti M instrument panel features hybrid-unique instrument meters, meter display and IT screen displays, providing battery and other essential system information. It allows the driver to view hybrid system and available navigation system information simultaneously. Fine Vision electroluminescent gauges, gear-like rings on the instrument cluster meters and Infiniti analog clock complete the elegant design. The M35h interior also offers standard leather-appointed, heated 10-way power driver and front passenger’s seats including 2-way power lumbar support, and dual occupant memory system for the driver’s seat, steering wheel and outside mirrors. An entry/exit assist system for the driver’s seat and steering wheel, heated front seats, sequential welcome lighting illuminated entry system and dual-zone automatic temperature also contribute to the M’s outstanding level of standard luxury appointments. Standard technology equipment includes Bluetooth® Hands-free Phone System, Infiniti Intelligent Key with Illuminated Push Button Ignition, HomeLink® Universal Transceiver and RearView Monitor. Other interior highlights include a large center console, power windows with one-touch up/down and auto-reverse feature, power door locks with automatic locking feature, power trunk release, retained accessory power for windows and moonroof, standard XM® Satellite Radio (XM® subscription required, sold separately) and 6-speaker audio system with AM/FM/CD, Radio Data System (RDS), USB connection port for iPod® interface and other compatible devices, steering wheel audio controls and speed-sensitive volume control. The M35h also features a standard Active Noise Control system, which generates “canceling” sound from four door speakers (and subwoofer for models equipped with a Bose® sound system) to reduce unpleasant engine harmonics. The Premium Package adds an Infiniti Hard Drive Navigation System with 8.0-inch WVGA color touch-screen display, XM NavTraffic® with Real-Time Traffic Information, XM NavWeather™ with Real-Time Weather and 3-day forecast (XM® subscription required, sold separately), Zagat Survey® Restaurant Guide, and 9.3GB Music Box® hard drive. The Premium Package also includes a Bose® 2-channel 10-speaker premium audio system, heated steering wheel and climate-controlled front seats. The Deluxe Touring Package also features semi-aniline leather and specially developed soft touch material for the armrests, door inserts, center console and kneepads. The Deluxe Touring Package’s genuine White Ash wood trim has been enhanced with real silver powder (Japanese Ash wood trim is offered on M35h models without the Deluxe Touring Package). 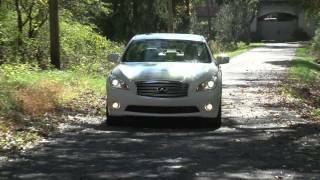 The Forest Air® system, first introduced on the Infiniti M, attempts to recreate the refreshing climate and natural breezes of a relaxing forest setting. System sensors automatically open and close air intake ports to reduce the intrusion of dust, exhaust or unpleasant odors into the cabin, while the special Grape Polyphenol filter and Plasmacluster™ air purifier help filter allergens, mold and viruses out of the cabin. Humidity control prevents the over-drying of air from the air conditioner, while Breeze Mode provides a natural airflow feeling, gently and subtly varying the airflow from the upper and front air vents. Four interior colors are offered with the M35h depending on which options are selected – Graphite, Stone, Java or Wheat. Like the M37, the M35h is available with a number of innovative technologies, including Lane Departure Warning (LDW) and Lane Departure Prevention (LDP) systems and Blind Spot Warning (BSW) and Blind Spot Intervention™ (BSI) systems, all of which are available as part of the Technology Package. Other available safety features include Intelligent Brake Assist (IBA) with Forward Collision Warning (FCW) and Front Pre-Crash Seat Belts. In addition, the M35h comes equipped with standard Infiniti Advanced Air Bag System (AABS) with dual-stage supplemental front air bags with seat belt sensors and occupant classification sensor; standard front seat-mounted side impact supplemental air bags; and standard roof-mounted curtain side impact supplemental air bags for front and rear-seat outboard occupant head protection. Also included are standard 3-point seat belts with Automatic Locking Retractor (ALR) and Emergency Locking Retractor (ELR) (driver’s seat ELR only), front seat belts with pretensioners and load limiters, front seat Active Head Restraints with 4-way manual adjustments, along with Zone Body construction with front and rear crumple zones and LATCH System (Lower Anchors and Tether for CHildren).